I’ve made salmon croquettes before, as well as various other fishcakes, and think they are a great way to stretch leftover fish. This week, I had two fillets of wild salmon to use up. I broiled part of a fillet and served it with my oven-dried tomato butter; the other part was cured with salt, sugar and fresh basil into gravlax. I poached the remaining fillet and served some of it with mustard cream sauce, then divided the remains between salmon chowder and these croquettes. That’s five extremely nutritious meals for my family (and probably $5 or less in cost per meal) without even getting to the gravlax yet—it is staying in the freezer until we have used up the last of the dill gravlax. 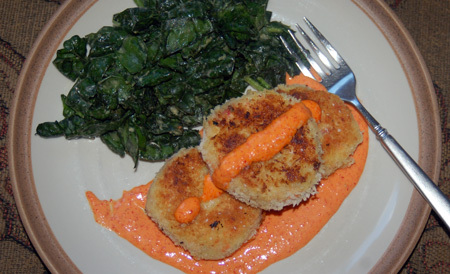 The croquettes stretched about half a cup of salmon into a hearty meal full of omega-3 from the salmon and olive oil, vitamin C, A and beta carotene from a local red bell pepper, and even some probiotics from the yogurt in the dipping sauce. I paired it with leftover kale salad with white bean Caesar for extra punch, not to mention a pretty color contrast with the sauce. 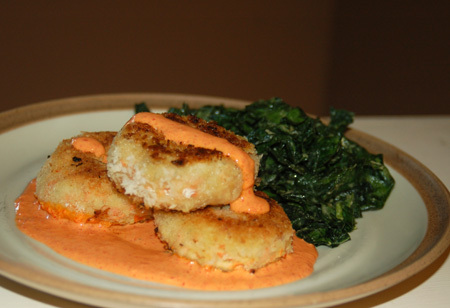 These are basically potato croquettes with some salmon added into take them from a side dish to a main course. Croquettes are an excellent way to use up leftover mashed potatoes, but I cooked and riced some fresh Yukon golds for this meal; minced or shredded potatoes, even rice, beans, or another grain or starchy root vegetable could be substituted. The recipe would also be excellent using gravlax or smoked salmon (even canned, in a pinch), and could be easily adapted for all sorts of flavor profiles—for instance, see my halibut romesco for a Spanish-style croquette. The roasted red pepper sauce is delicious, and could easily transition to a salad dressing with some olive oil whisked in. Saute bell pepper in a little olive oil with the shallot and garlic, until tender. Meanwhile, place potatoes, salmon, 1 egg, salt and pepper in a bowl; mix well to combine and add the bell pepper mixture. Place bread crumbs in a wide, shallow bowl. Place remaining egg in a second bowl and beat lightly. Place flour in a third bowl. Form salmon mixture into 3-inch patties, about 3/4-inch thick (I dished the mixture out with my quarter-cup scoop and flattened the balls into patties). Dip each patty into flour, then egg, and finally press to coat evenly with panko crumbs. Transfer patties to a large baking sheet. Cover with plastic wrap and chill for at least 30 minutes and up to 4 hours (I cooked mine right away with no detriments, but the make-ahead factor can be useful). Meanwhile, make the roasted red pepper sauce (recipe below). When ready to cook, heat 1/4-inch oil in a large skillet over medium-high heat. Cook patties in batches, turning once halfway through, until golden and cooked through, about 3 minutes a side. Transfer to a paper towel-lined plate to drain. Serve hot, with a dollop of roasted red pepper sauce. Place all ingredients in a blender or food processor and puree until smooth. Taste and adjust seasonings before serving.